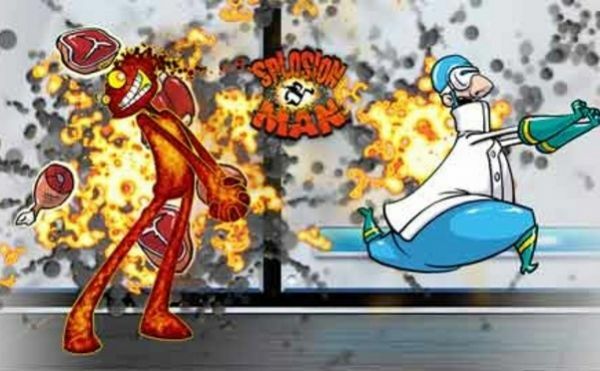 'Splosion Man is the zany platformer exclusive to the Xbox LIVE Arcade that had gamers excited for co-op this past summer. We all seem to enjoy timing our simultaneous explosions in co-op with one of four different colored 'Splosion Men. Now that the games technical issues have been patched, I've given the co-op another go, and was inspired to share this audio recording I discovered in one of the labs. * Our own OrigamiPanther has helped me transcribe this tape to be shared here today. After several failed attempts to interview the somewhat unstable 'Splosion Man with his buddies, 'Splodey, Mr. 'Splode, and 'Sploder, we have finally created a device similar to an airplanes black box in which to store our recording equipment for later retrieval and scientific study. To anyone who finds this box, please share the results of these questions with the public. The people need to know what went on here. "So 'Splodey, what would you say was the goal of this experiment you have taken part in?" 'Splodey stops his jumping jacks and eyes the interviewer. We're not sure what he's thinking, but he seems to be mulling over an answer in his little blue head. "The effects of excessive caffeine use by children, you say? That's very interesting. Would you say the ability to explode on will was an accidental side effect, or perhaps the ultimate goal." 'Splodey is joined by his green counterpart, Mr. 'Splode to answer the question. Mr. 'Splode begins by circling the room making airplane noises. It would appear that 'Splodey wasn't happy with the question, as Interviewer A has just been packaged for sale by Omaha Steaks. ** As our next interviewer is preparing to ask the important questions, 'Sploder, and 'Splosion Man join their pals in the beautiful glass interrogation room. "Well, I hope you lot have that out of your syste--"
Interviewer B was not well liked. He was unable to finish his question before the four simultaneously exploded off of each other toward different corners of the room. After the janitor enters the room to sweep up the pieces, our third interviewer is prepared to finish a few questions. "Hi guys, if you don't mind we have another very important question for you. We see that your cake is very much not a lie, and you love ribs, steaks, and other meaty products. What do you have to say about the statement: "There is no 'I' in team, but there is an 'I' in meat pie?" Would you ever actually mix "meat" and "pie," or is cake exclusive for meat mixing? Now this is important, please take a moment before you answer." "You would only mix them under the right circumstances you say? And 'Sploder verifies there is definitely an "I" in Meat Pie? Words of wisdom my good 'splosion...things! Okay everyone, another doozy here: 'Splosion Man and company, how many 'splodes does it take to get to the center of a doughnut loving scientist?" 'Splosion Man contemplates the question momentarily, before he and Mr. 'Splode lean in to the interviewer to reveal the answer to this question. The 'Splosion Men begin shaking in anticipation. Interviewer C answers the question for them quite simply, any one or more explosions will get to the center of a doughnut loving scientist, but the more 'splodes, the better. As they sense the void and quiet in the room, the co-op team of 'Splosion experiments begin to explode up and around of the room. Shards of glass, vending machines, tables, and computers are all destroyed in a beautiful array of explosions in the process. A fourth and final interviewer has prepared life-altering questions to add to the end of our time studying the 'Splosion Men. "I like movies, and I hope you guys do too. This question will pit you against the original master of explosions: If you could remake any Arnold Schwarzenegger movie casting yourself in his role, what would it be?" 'Splodey holds up his hand showing that he'd like to answer the question himself. He lowers his head to get himself in character. He sits on the floor, imitating reading a book to the other 'Splosion Men that have gathered around. "Kindergarten Cop, eh? Well, that's not really actio--"
"No, no! You're right! It is Arnold's best work. One last question that has to do with our very delicate environmental concerns: If any of you 'splode in the woods, and no one's around, does it still contribute to global warming?" "There we have it then, right from the source. Now, I just have to get these notes to the proper news sources to put the people at ease. Thank you gentleman, that will b--"
Each of the 'Splosion Men explodes at random, finishing the demolition of the current room. They are free to run wild, we wish them the best of luck in their future endeavors. Four scientific journalists were harmed in the making of this interview. We won't even tell you how many times we've tried before this. * No audio recording was actually discovered. ** Omaha Steaks does not package or sell people (or, doughnut loving scientists) in the form of steaks.